There is no tennis on October 3rd as per the original fall schedule. Fall tennis will resume the following week on Saturday, October 10th. Tennis Video of the Day: What's It Like to Face a 150MPH Serve? THANK YOU TO ALL THE VOLUNTEERS WHO MADE THIS EVENT POSSIBLE. Thank you to all those who attended and enjoyed our event. As much as I like to head scratch about why people love to endlessly watch their sports, especially ones that they neither currently play nor have never played, I'll give everyone a pass on this part of their persona under the phrase "live and let live." Who am I to judge after all. But I need to step up on my soapbox, and scream at the top of my lungs, when someone tells me that tennis is boring to watch. I of course politely ask just what it is about the sport that does little to excite, and they usually respond, in my words not theirs, that fatigue develops while watching players hit back and forth. Or the answer might be that disinterest creeps in when the combatants start play with serves that both begin and end the point. It is usually about this time that I go on a rant about all that is really happening out there, but then eventually pull myself back realizing that nothing I say will have any impact. It is what I, in my humble opinion, refer to as sheep mentality. All my friends watch "X" so therefore I watch "X". With that said, I will admit that many of us are groomed from childhood to enjoy the sports that interested our parents as exposure always begins in the home. Also, sports seems to be about socializing and having common interests with friends or family members. But I must be clear that I appreciate the passion these folks have for whatever sport they follow. Watching these individuals root for their favorite teams, regardless of why chosen, is always interesting. I actually had a brother in law, God rest his soul, that rooted for Notre Dame football for some reason I never understood. He did not attend that college, and neither did his parents nor children. But I recall him adamantly following their success and failure as if his livelihood depended on it. It did not. The games were obviously exciting to him as they are to many, and he really enjoyed their drama. Were they exciting to me when he and others were huddled around the TV on holiday visits instead of engaging in conversation? No. But I would not be one to discuss how much time was wasted on huddles, flags thrown on the ground, or huge piles of bodies dispersing after what looked like the ultimate invasion of personal space. If someone ever asked me about whether I liked football, they would just exit the conversation quietly after my answer that "I'm a tennis fan." Why did I always feel like a leper after that answer? The truth is, if one does not play the sport or has never played the sport, they cannot possibly understand what one feels when watching professionals play this most incredible game. Athletes serve balls (that is put the ball in play) at speeds from about 110 to 145 mph, they rally balls (that is hit balls back and forth over the net) anywhere from 2x to 25+ strikes of the ball that are hit with as much venom, spin, direction, and guile they can muster, and winner shots can be as soft as a feathery drop over the net or a cannon shot line-licker at speeds faster than most of us blink. I could cite contest after contest of exciting and dynamic match play from international prime athletes playing in tournaments held all over the world, but I will just let the numbers on a recent match speak for my point. This happened to be a semi-final contest between Milos Raonic of Canada and Stan Wawrinka of Switzerland at the ABN AMRO World Tennis Tournament held in Rotterdam, The Netherlands on February 14, 2015. Although I have seen longer matches with even more drama, I cite this battle due to the data in the post-match stats. The match was 1 hour, 38 minutes in length which seemed about average at this level of play at about 1 hour per set. The final score was 7-6 (3), 7-6 (7) with the swiss coming out on top. Tennis fans know that a score of 7-6 means a tiebreaker, and as both sets went to tiebreakers, you might imagine it was close. Total points won on serve, with both of these guys able to crank up the big gun, was 64 or 74% Wawrinka to 57 or 78% Raonic. 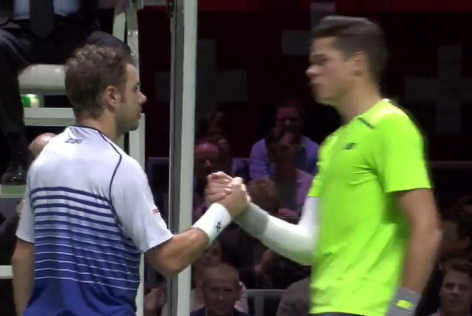 But even more telling was the Total Points Won stat of 80 to Stan the Man and 79 to his challenger Milos. So in other words, after battling close to 2 hours hitting brutal serves, screaming groundstrokes, and soft-hand volleys, only 1 single point inevitably separated first and second places. Now THAT is what I call exciting. 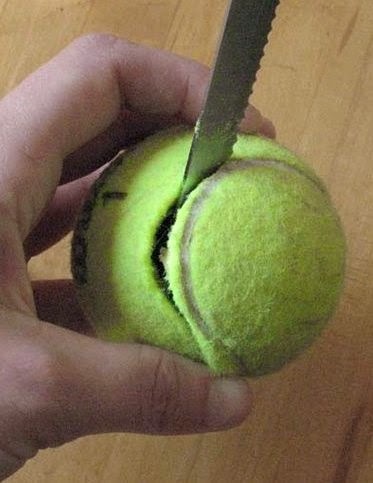 And if anyone reading this does not think so, I can only suggest that they give watching tennis a try. They might just be pleasantly surprised. Much to the surprise of both Trish and myself, we received an invitation in the mail from the USTA Middle States informing us of an awards ceremony this Spring. 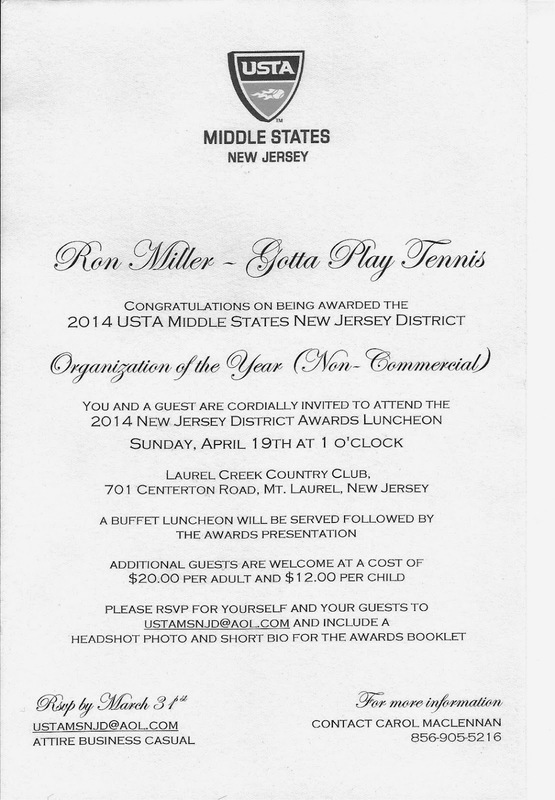 But the bigger surprise was the fact that Gotta Play Tennis has been awarded the 2014 USTA Middle States New Jersey District ORGANIZATION OF THE YEAR (non-commercial). Apparently the nomination process is meant to include those who have "contributed to the promotion and growth of the sport of tennis in the Middle States Section" which include 17 USTA sections divided regionally into six districts. First and foremost, we would like to thank the many parents and children from the Gloucester Twp. 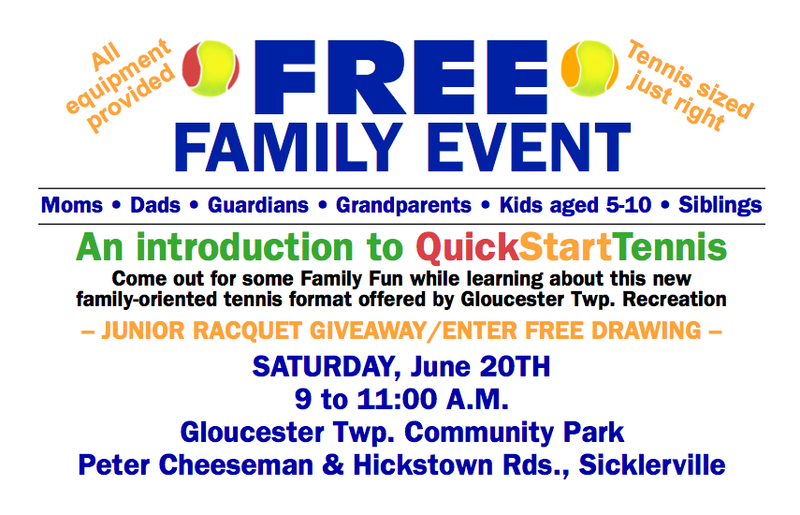 South Jersey area for all of their participation and involvement with our youth tennis programs. Without them, our programs would not exist. Secondly, we need to recognize the Gloucester Twp. 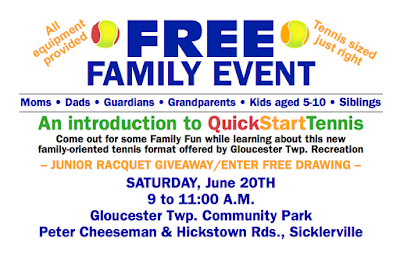 Recreation department for their steadfast commitment to supporting our tennis programs in their community by allowing us to utilize tennis courts at both Point Ariel Park and Gloucester Twp. Community Park in Sicklerville, NJ. Special thanks to Recreation Supervisors Diane Jones and Bill Fagan. Last but not least, Trish and I are humbled with this recognition by the USTA Middle States NJ District (2014 president Carol MacClennan). Special thanks to Carol and also to the supportive efforts of USTA Tennis Service Representative Lori Schwartz and Associate Executive Director for the USTA Middle States Ben Zislis. 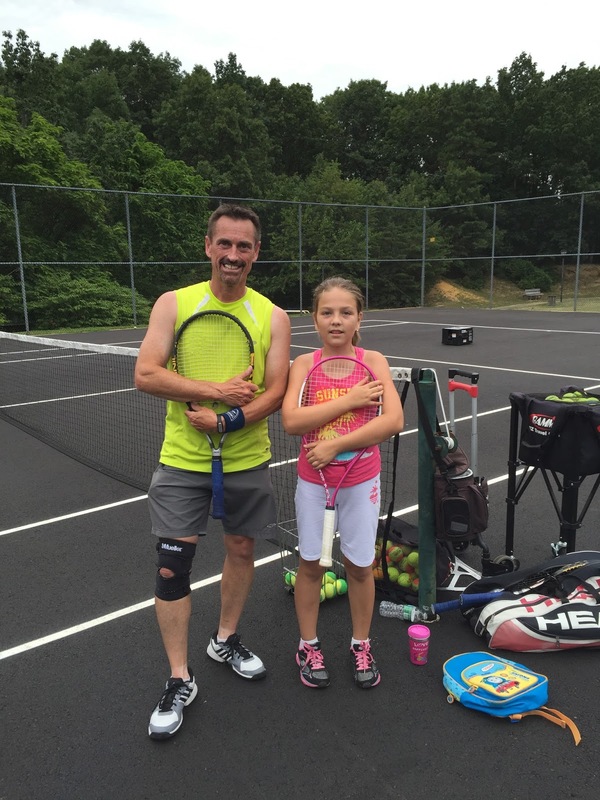 As we move forward in 2015, we are as excited as ever to bring quality tennis programs to the masses through low-cost recreational programs available to children starting at the age of 5. 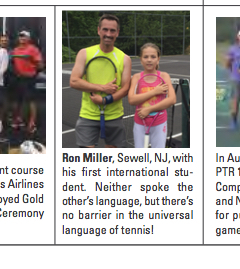 We hope to continue growing the tennis community in South Jersey for many years to come. It's time for us to study how the tennis stroke known as the slice can add that dimension to our games for the benefit of both our offensive and defensive shotmaking. We'll also glance at how this seems to be growing in popularity with current pros on the tour today. As a way to kick off the new year of 2015, I had the opportunity interview Gary Bala of TimelessTennis.net. Gary and I take an over-the-shoulder look at the 2014 Grand Slams in the world of men's tennis and then consider how those results may may affect the 2015 ATP tour. Now you have a way to show your support for my efforts with what I hope has been valuable, entertaining and inspiring content since 2009. It is called Patreon. "Founded in May 2013 and based in San Francisco, California, Patreon was created to enable fans to support and engage with the artists and creators they love. Empowering a new generation of creators, Patreon is bringing patronage back to the 21st century." With just a little help on your part, I can continue some of my past work and even grow my content to become a more valuable asset to whatever place tennis has in your life. You will see that, by working together, very little effort on your part can make a huge impact on what I can provide for my patrons. Note: The Gotta Play Tennis website and podcast have never been FREE from hosting fees, substantial research, writing and recording time, equipment purchases and graphics creation. Workshops attended, insurance, memberships to organizations, and certifications, are also not FREE. In other words, I have carried the burden of the costs for you since 2009. Now I am asking for your support in a very small way. Become a patron of Gotta Play Tennis and continue to enjoy even more and expanded content with the help of my supporters.